It is still impossible to establish a permanent foothold in the atmosphere, in a way to allow for a commercially viable mass-market applications. HiperSfera Airship has the ability to position a dedicated payload high above the area of interest, in a reliable, safe and cost-effective manner. It can do all that for an extended period of time either as an individual vehicle or as a coordinated airship fleet. 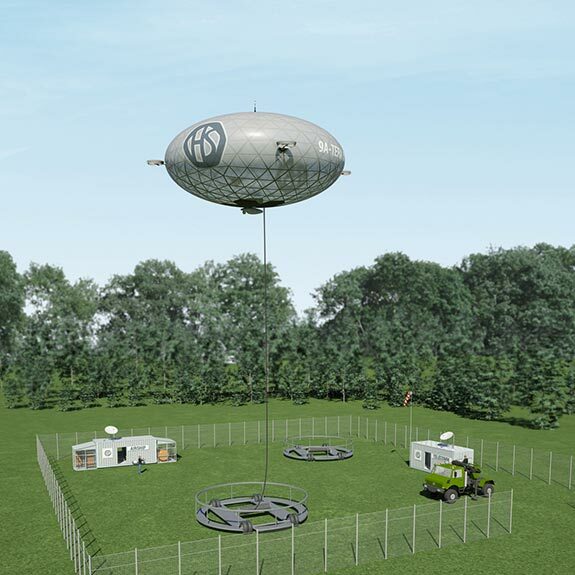 HiperSfera Platform leverages its proprietary unmanned airship technology, either in moored or free flying configuration, to provide a robust industrial-grade payload capability. 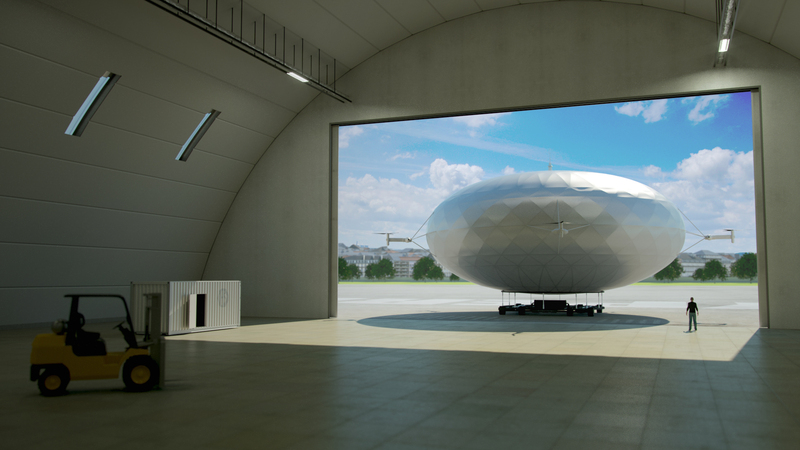 HiperSfera airship is designed for a slow flight or hovering, all-weather long-endurance operations and mission specific payloads. The HiperSfera System achieves its peak efficiency when used in a fleet configuration, providing a real-time coverage of a large ground surface. Multi-platform aspect of the HiperSfera airship technology caters to a Portfolio of Possible Applications. Provided turn-key solutions are based on payloads from Mobile Broadband Telecommunications and Continuous Remote Sensing* industries. *Continuous Remote Sensing has a revisit time of the observed area anywhere from 1 day to less than 1 second. HiperSfera company is establishing strategic partnerships for a rapid development and optimization of innovative solutions, as well as for their swift global market introduction. Below we highlight a small selection from our Application Portfolio. As a telecommunication platform, HiperSfera system can serve as a mobile broadband network with 10Gbps cell “towers” (persistently hovering airships with presently commercially available telecom equipment). As a mobile network turn-key solution it significantly outperforms traditional broadband network architectures in several key aspects. Those include faster service deployment times, as well as significant reduction in operational and maintenance costs. In addition, the solution provides availability of over 99% of year-round service. 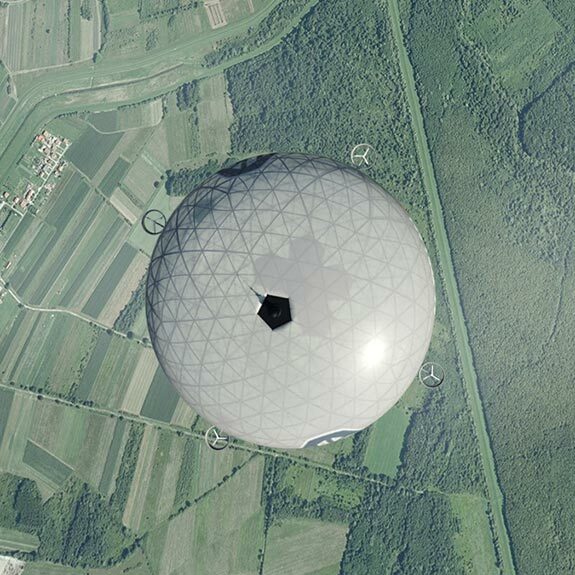 As a remote sensing (RS) platform a fleet of HiperSfera airships can, through continuous imaging, directly connect a physical reality of large portions of the ground with the internet. As such, it can be an irreplaceable tool for Farming, Disaster Management, Search and Rescue operations, Border Security, Early Warning against Forest Fires, Poachers, Illegal Lodging, against Drugs and Human Trafficking, among other applications covering almost any field of human activity. If you find these applications interesting and in any way beneficial to you, your community, company or any other organization, do let us know - contact us!